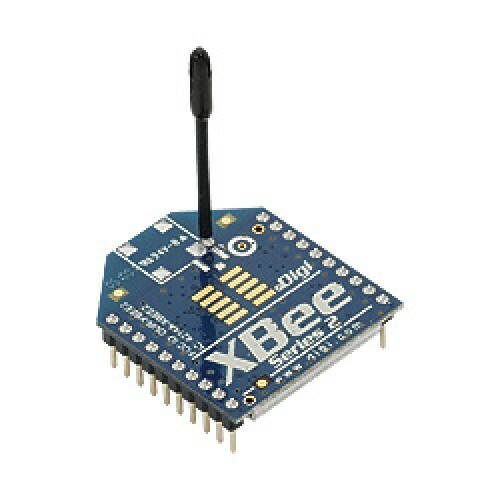 The (XB24-Z7WIT-004) modules are part of the XBee ZB family which provides ZigBee level interoperability with ZigBee devices from other vendors. This hardware is only compatible with other ZB XBee modules; it is not compatible with the XBee 802.15.4. The most common factor in determining whether to use ZB is the potential need to tie-in with other ZigBee-compatible networks. If this is not a requirement, 802.15.4 may be perfectly suitable for your project. Still having trouble deciding whether to use 802.15.4 or ZB? Take a look at our XBee Comparison Chart. Because the XBee modules have 2 mm pin spacing, we recommend one of our adapter boards for each module. Our adapter boards provide several advantages to the XBee modules such breadboard-friendly standard 0.1 inch pin spacing, mounting holes, and easy-to-solder connections. Even if you are communicating point-to-point without a PC, we still recommend that you always have at least one XBee USB Adapter Board so you can easily configure and test each XBee module prior to putting it in a point-to-point application. Energy Meter Shield allows to sense active power, reactive power, RMS voltage and current, among oth..